All transactions are safe and secure with a reliable history in online purchasing behind each of our associates. 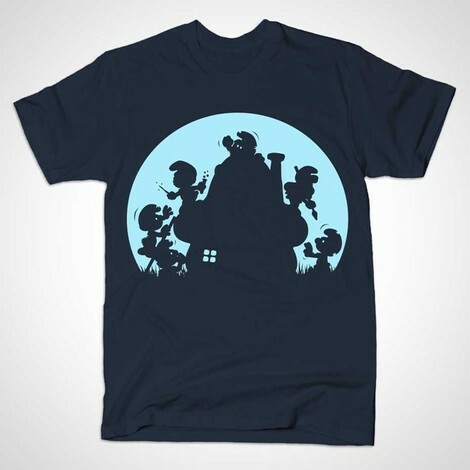 Buy the Smurf Zombies t-shirt to own Smurfs clothing and merchandise. If you like flesh eating zombies, then you'll love the zombie frenzy on this Smurf zombie tee. The village has been overrun and two survivors, including Smurfette, are armed and ready to kill some zombies on what is anything but a smurfy day. If this Smurf t-shirt makes you want to help save the village, then grab it before someone else does. Missing out on this design is bound to leave you feeling blue. Also, get some Smurf plush stuffed animals or Smurfette costumes from the gallery to help you start each day the smurfy way. You'll be the smurfiest person in the whole wide world! In addition to the Smurf Zombies tee above, browse the Smurfs Clothing Gallery for more apparel like men's and women's clothes, kids shirts or hoodies.